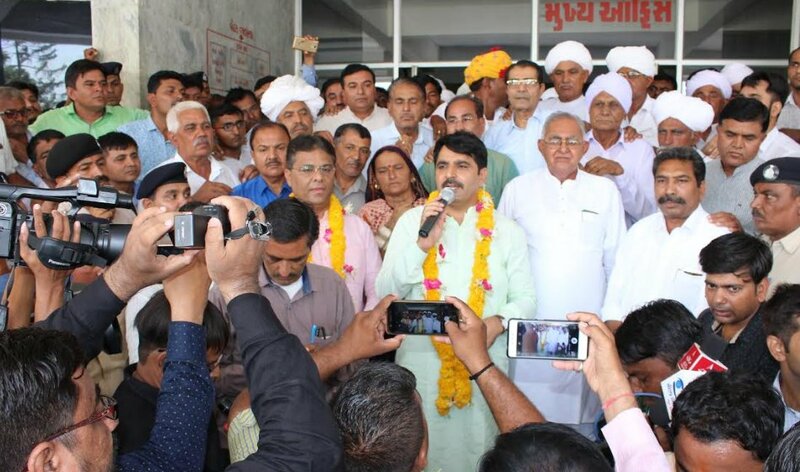 Palanpur: Shankar Chaudhary and Mavjibhai Desai were reelected unopposed on the posts of Chairman an Vice Chairman of Asia’s largest Banas dairy today in the meeting of board of directors. This will be the second 2.5 years term for Chaudhary and Desai. Rs 8,263 crore turnover, daily 65 lakh milk collection, valued added milk products, Banas daan cattle feed production, better renumeration to milk producers compared to other dairies even in slow-down period, 24 lakh milk pouch sell in last two years, Rs 100 crore advance loan repayment, modernisation of technology for milk producers, daily account through common software innovation, 5500 kg honey collection, Rs 8,80,000 additional income for farmers through honey, potato processing and value added products to ensure better prices to farmers, plans for oilseed processing to launch Banas Oil, Rs 17 crore income to 3.5 lakh member families per day are some of the highlights of Banas Dairy’s success story in the recent past. Out of 100 paise revenue, Banas Dairy gives 82 paise to farmers. NDDB has presented dairy excellence award to Banas Dairy in year 2017 while in 2018 Banas has received award for dairy plant management. Banas Dairy arm Galbabhai Nanjibhai Patel Charitable Trust has received approval to start district medical college in Banakantha. A 700-bed modern hospital has also been planned. Union minister and member of Lok Sabha from Banaskantha Shri Haribhai Chaudhary, Banas Dairy director and minister Parbat Patel, MLA Shashikant Pandya, Kirtisinh Vaghela, former minister and district BJP chief Keshaji Chauhan, Banas Bank Chairman ML Chaudhary, former Chairman Dalsangbhai Patel, former minister Harjivan Patel among others were present on this occasion to congratulate Shankar Chaudhary and Mavjibhai Desai on their reelection. In last two and half year, dairy’s collection was up from 40 lakh to 65.81 lakh litre per day. Not a single day was milk holiday for the dairy. Gujarat Food and Drug Control Administration had checked 192 samples of Banas Dairy milk. All were found valid and upto the mark in terms of quality. The dairy has launched online initiative for procurement of material and services. This has resulted into saving of Rs 200 crore for dairy. Only due to online purchase of row material for cattle feed, the dairy saved Rs 80 crore in 9 months. Dairy has witnessed increase in average fat from 4.99 to 5.05. Dairy’s annual turnover has been up from Rs 4,686 crore to Rs 8,263 crore. Pouch milk sell has been up from 15 lakh to 24 lakh litre. The dairy has installed common software across 1600 milk producing mandlis. This makes it possible for farmers to get daily account on mobile phone. Daily cattle feed production has been up from 1200 mt to 1600 mt. Cattle feed daan which is available for Rs 22 or more in open market is offered at the price of Rs 15/kg by Banas. Banas Dairy contributed for construction of more than 25,000 toilets. The dairy has commissioned 1,000 kw solar power plant in Palanpur. The dairy paid Rs 700 per fat to milk producers which is the highest rate in last 50 years.